Info about Ladybugs, see more below. To the right you will find a picture of Healthy root tips. If your root tips look like this the plant is healthy! The most important thing to know about orchids is, DO NOT over water them and water them in the morning or mid-day. If they are kept soaked they will die. Many varieties can be kept outside under a oak tree. The best orchids for growing under a tree are Cattleya and Dendrobiums. If you wish to grow orchids inside or on a windowsill try the Phalaenopsis or Paphiopedilum (lady slipper). The Phalaenopsis is the better one for growing indoors. They like bright but filtered light and do not take low temperature well at all. They will stress and possibly die if the temperature goes below 55 degrees. The Phalaenopsis and Paphiopedilum species can not be left wet at night. A very easy to grow orchid is a Dendrobium. After they finish blooming it is not unusual for the plant to look like a cane for a month or two. 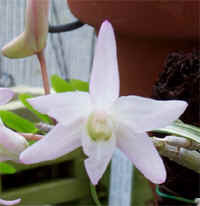 Several Dendrobiums also look like a cane all winter long and then bloom in the spring. If your Dendrobium has lost it’s leaves it is not dead. Don’t throw it out, keep it under an oak tree and wait a while you will see new growth and soon new blooms. Many of orchids are available from local hardware store. I feel it is better to get your orchids from a regular grower. They would be in better health, less possibility of disease and you can learn more about the plant. Do not keep orchids out when the temperature goes below 50 degrees. This will cause the cells in nearly all genera to burst when the sun comes up again. Try to find a grower in your area and visit them, there are so many different type of orchids you will be amazed when you Discover Orchids. See below for a good tip to help with your pest! It has been working for us! We have had many people ask me how I keep my plants pest free. The answer is simple and not chemicals! We do have chemicals and we at one time used them as well but we have found a better alternative, LADY BUGS! For example we had a single plant in a 2 inch pot that became covered in literally hundreds of Aphids! We tried everything possible and it just did not work. From that point on we hung up the chemicals and had my family place every Ladybug they could find in my greenhouse! In a few days the plant was clean! We were able to go for 1 1/2 years with no chemicals, we have gotten 7-1st place; 3-second place and 3-third place ribbons in two AOS Shows. By the way, this was the first time we have entered plants in a show and I took 17 plant entries to the two shows combined. We still have the chemicals on hand just in case but why use them? We prefer not to have chemicals on my plants. Please visit the link on the Lady Bugs and let Jim know we sent you. For more on pest click here.